Place the leaves of the various vegetables, previously selected and cleaned, on a Gastronorm tray. Dry in a carbon-fuelled oven overnight at about 80 °C. Place the sheets of gelatine to soften in fresh water. When soft, drain them and add them to all the liquids poured into a pan. Bring to the boil, take off the heat, pour into a container and cool. Blend the yolks, drizzling in the oil. Add salt and pepper to taste, then add the fir essence obtained by juicing some fresh fir tree needles. 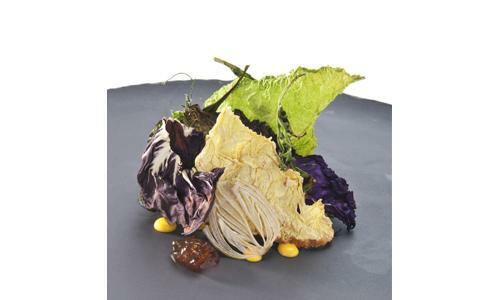 Garnish the base of the plate with the mayonnaise and vinegar jelly and lay the dried leaves on top. Serve.